The drummer on this was one of the worst we ever had and fitted well that kind of raw, untalented sound recalling a lot of classics of the ’80s. This live was the first CB show ever at El Paso, a place of friends GTB has been attending since even before CB were born and a kind of mother-house of punk in Torino (the town that gave birth to the best italian HC acts ever: Negazione, Declino, Rough, Nerorgasmo and so on). After the show released on this 10″, CB went on playing regularly at El Paso, at least once x year for the whole decade that followed. This record is mostly a collectors’ item (not easy to find); musically its content is too elementary compared to other CB works, at least – that’s how we feel about it. The CB thanx-list included these bands for the inspiration: Wretched, Eu’s Arse,Indigesti, Sottocultura, Uart Punk, Varaus, Mob 47, Riistetyt, Bastards, Shitlickers,Terveet Kadet, Sekunda, Rapt, Confuse, UBR, Olho Seco, Armagedom… so, that’s an idea of how we wanted to sound, besides the usual Grind features. 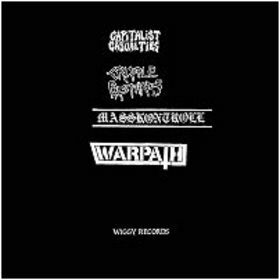 Of the other bands on this double 10″ set, Capitalist Casualties were the absolute winners! > comes in a wonderful packaging, a huge poster-sleeve bent in 6 squares, on one side with all band’s infos – one the other with a S/M art.